I don't want to brag, but I've spent the past week hanging with two very important persons. The great Alfred Hitchcock was kind enough to make a special appearance in my blog post There's Always a Hitch, his presence therein affording me with a terrific opportunity nobody else can ever lay claim to: I got to direct Hitchcock. And know what? As an actor, Alfred Hitchcock should be treated like cattle! Next I spent some time helping Pope Benedict get ready for his upcoming Twitter debut in The Pope's Tweets. True, the pontiff never directed a hit movie, but he's got a bit of clout as well and now thanks to me he can spell "WOOT" in 17 different languages! My entry in the Friday Fictioneers is below, based on the picture prompt above. Thanks as always to Rochelle Wisoff-Fields, both Director and Pope to this enterprise, who has never yet treated any of us like cattle no matter how much we might sometimes deserve it. When the announcement was made, he had been the first to volunteer to walk though the paneled hallway and into the glowing portal that would lead to another time and place. It would not be just any time and place, however. Irrefutable calculations had proven that the portal would take him to the most pivotal event in the history of humankind. It could not possibly do other. Knowing there would be no return as well as he knew he had nothing to return for, he reached the portal and calmly walked through the glowing light that framed it. He heard a voice. It could have been of any time or place, of any language or person, or of any nation or peoples of the world. Yet he understood. "Congratulations to us all," said the voice. "It is a girl ...."
Note: After reading and responding to the comments below, I made a small change to this piece. Aaaaaah. This was incredibly poignant, Perry. Is this the voice of experience? That little girl already has her daddy wrapped around her tiny pinkie. Very nice. Aww, how sweet. You certainly kept me on my toes. I was fully expecting a spooky, sci-fi conclusion. The ending you selected was much better. One of your best. Unforced and well paced, this story took us all for a fine read and ride. And a perfect ending/beginning. Time travel? Mandelbrot functions? Or just a door into his new life? I think the latter, but it matters not because it works coming and going. Thanks, Rochelle. I deliberately left it ambiguous. It could be someone who already lived whose tremendous impact on humanity was not understood, someone currently living or alive in the future who will have a tremendous impact on humanity, or someone who will simply bring meaning to the protagonist's seemingly purposeless life. Actually, Jess, it might be a sci-fi conclusion. Perhaps the girl is someone yet to be born who will change humanity or perhaps it is the protagonist's own daughter. (The word "Congratulations" if addressed to him indicates it might be the later). Who can say? Well, Doug, you got me there on Mandelbrot functions. But your questions are spot on as I envision the piece. Either a woman in the past or future tremendously influences humankind or he is looking into his own future. It could be a beginning or something that has already happened which changed the course of humankind but is not at all understood. "Congratulations, it's a girl" could be addressed to him or to everyone on the planet for all time. I was thinking reincarnation. Nice Job Perry. Well told. I was thinking time travel or something...very well done. Tom, That's a take I hadn't thought of but another good one. Actually I favor the alternative that a woman is to be born in the future who will alter humankind, hopefully for the good. "Congratulations" sort of implies for the good, but at the time of anyone's birth people always say "congratulations," not knowing what's ahead in the future. Yes, time travel is definitely involved, although the outcome of that travel is unknown. In some manner it involves a woman. yup. can't imagine a more important time. could be his mother being born, or his own child. well done. sorry. i have fun doing that. No problem, I always appreciate suggestions. Hadn't thought about it being his mother. I'm wondering if the word "congratulations" coupled with "he knew he had nothing to return for" tips it too much towards it being his daughter and away from other interpretations. Which was not my intent. See, I need all the help I can get! Wow, every possibility that occurred to me has already been mentioned...and more. That being said, you did an excellent job with this. That's my story and I'm sticking to it. In fact, I'm just honored to be reading the story of a person of such influence and importance!! Honored? I don't know, he's just a regular guy with nothing to lose who either glimpses the future of humanity or finds his own. I was thinking reincarnation as well. Here is was a man and now he would get to be a girl. Surprise! But they all work, don't they? Beautiful piece. I walk through a new portal every morning and look around and say, "Where the hell am I?" About that time a big butch looking woman comes in and asks if my jacket it too tight. If I say "No" she cinches it up till my arms are numb. Then a doctor examines me and tells my wife, "I'm sorry, Mrs. Gayer. We'ver tried everything and he's still not funny." This story got me captivated, and reading the comment even more so. To end the story with a birth is nevertheless very smart. I can see a story running in circles through these hallways. Ending this with a birth opens up your whole story. It's full of possibilities. Like you said, it could be happy, or maybe something more sinister is at work. Nice job! Debra, it's funny how people have come up with interpretations I never did. I thought that people would mostly think it is a female messiah yet to be born with a few thinking it was a child of the protagonist. I didn't see reincarnation because he's not dead! Glad they all work. Thanks! Russell, the sad thing is that you love it when the big butch looking woman cinches your jacket! Hell, I think I like it too. I'm sure the doctor would find you funny unless he's just trying to jack up the bill. Gee, I'm sorry I wrote "jack up." Yes, I wanted it to be provocative but people came up with many ideas I never thought of. One of mine that nobody thought about was a central figure in the history of the world whose contribution had been taken for granted or was unknown (such as the birth of the female who invented the wheel). I tend to feel now that the word "congratulations" throws people off, making them think the event is more contemporary to the time traveler than it might have otherwise been. Thanks for writing! I hope it's not sinister, but yes, it might be the birth of the woman who blows up the planet with nuclear weapons. Yet her parents would still be warmly congratulated upon her birth. Yes, at least it's clear we're not the ones who did the worst harm to humanity, although we're not the ones who benefited it the most either. Glad, you had fun. Me, I'm going nuts trying to figure what the hell it IS all about! I interpreted it as he walks through the portal...and is reborn as a girl! Perhaps this was not what he was expecting? That's right! And taking it further, he is going to be the woman who changes humanity, which clearly brings purpose into his previously unsatisfactory life. I like it! It's great! It's not at all what I was thinking about. Tipsy Headrinse? Pope Billy Bob? That's funny! Please write those ASAP! Thanks, Ron. May the coming era of Lady Bao Ting, the Grand Dictator of Earth, treat you well! 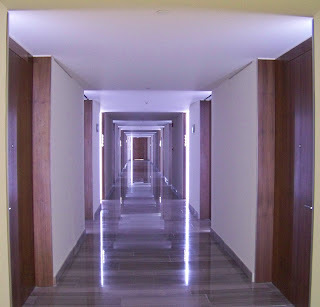 I like the idea of the hallway being a portal of time and space. But I have to say that's the strangest story I have read so far in terms of the ending! Oh see now I interpreted it as the entry to parenthood, which is like stepping through a portal ;) Interesting story! I had no idea it was going to seem so strange when I wrote it. It seems to have grown in "Strangeness" over time! Thank you. I can no longer decide for myself, I decided. Funny how that was my last interpretation. I saw it more as the birth of a woman who would change the course of history in some way or of someone who had already done so but knowledge of her had been lost or misunderstood. It could be the guy's daughter too! I was thinking time-travel as well until you zapped us with that twist at the end. I like the idea of a girl being sent to sort out this messy world and change the course of history. What a fabulous premise. Nice work, Perry. Very good, nicely ambiguous. I'm a sucker for time-travel stories. That is the premise I like the most too. Now to write the sequel! I can't wait to meet that chick being born in about 30 years either. That means even more time travel!